By now, many of you will have heard about the 2017 Fyre Festival and the various fraudulent activities perpetrated on the concertgoers, and the public at large, relating to the marketing of this event. You may have even watched one or both of the documentaries on Netflix or Hulu about the event and the controversy surrounding what was promised and what was delivered to ticketholders for the event. So what went wrong? What can we learn from the marketing of the event? What trends, in particular in the social media influencer space, do we anticipate we will see as a result of the outfall of the Fyre Festival? The idea for the festival was hatched as a way to promote an app Billy McFarland's company, Fyre Media Inc., planned to launch which would connect consumers directly with talent, thereby cutting out the booking agent/middlemen in this process. What started as a small intimate event geared towards industry insiders quickly morphed into what was being billed as a tropical island version of Coachella. Ja Rule signed on with Billy McFarland and the two went to work planning the promotion of the event. In what's been billed as one of the most highly successful influencer campaigns, on the same day, at the same time, approximately 60-65 paid super models, celebrities and influencers, including Bella Hadid, Hailey Baldwin Bieber and Kendall Jenner (who was allegedly paid $250,000 for one post) posted an orange tile with comments about the event and an accompanying hashtag #FyreFestival. This initial marketing push was followed by an increase in the number of hired influencers (all told about 400) as well as a number of well-produced videos of the supermodels in the Bahamas promoting the event. The promotional video for the event touted it was to take place on a private island in the Bahamas that was previously owned by Pablo Escobar. Tickets and concert packages included the run of the mill ticket for the two-weekend event (starting at about $2000) as well as private events and excursions during the event, gourmet food, and high-end luxury packages, including accommodations at fabulous villas on the island and dinner with a festival performer, at a price tag of $400,000. The follow-on marketing including the models and influencers posting what purported to be authentic, organic selfies of them and their friends enjoying the Bahamas and talking up the acts for the festival. Nearly all of the content posted by the hired influencers neglected to include any type of indication these people were being paid to promote the event. As a result of the marketing blitz, nearly all of the tickets for the event were sold out in a matter of a few days. Unfortunately, the promoters of the event had no experience planning a festival of this size, the various island venues for the event fell through and both the caterers and the music acts ended up backing out of the event. Also, a considerable number of the super models and influencers who promoted the event apparently either never intended to actually attend the event or, in the end, were cautioned against attending because it became apparent the event was going to be a disaster. The final venue was on a part of the island of Great Exuma, but it wasn't a private island previously owned by Pablo Escobar. There were no luxury accommodations for the majority of the concertgoers, but rather only low-budget half-erected dome shaped disaster-relief tents with a couple of mattresses and pillows and a rug or two - all of which were soaking wet as they'd been left outside in the pouring rain. The only food provided were soggy bread and cheese sandwiches with some salad - no fine dining. There was little to no infrastructure, clean water or toilet facilities. Concertgoers quickly discovered they were duped and tried to leave the island as soon as possible, but exit from both the venue and the island was challenging due to the lack of organized transportation, the fact that concertgoers had little cash as they had been encouraged to go cashless and deposit all needed funds on magnetic bracelets in advance of the event, and due to the large number of people who were effectively trapped. Multiple class action and private lawsuits have since been filed against the promoters. Additionally, the FBI and the Securities Exchange Commission ("SEC") investigated the event. The SEC brought suit against Billy McFarland for wire fraud and fraud on investors and, as a result, McFarland was sentenced to six years in federal prison. Also, just recently, the trustee overseeing the Fyre Festival bankruptcy sought and was granted the right to subpoena a number of individuals and well-known talent agencies responsible for booking both social media influencers and various artists for the Fyre Festival in order to try to piece together the bankruptcy estate's financial records from third party records. The lack of disclosure of the influencers' material connection to the Fyre Festival was false advertising and a violation of various rules and guidelines of the Federal Trade Commission ("FTC"). Virtually none of the posts included #ad, #sponsored or any other indicia indicating the influencers were being paid to promote the event. This is something the FTC has been paying greater attention to over the past several years. 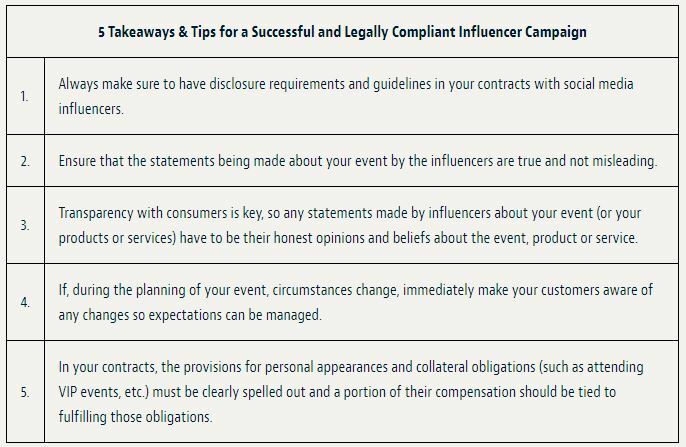 The FTC has even sent out letters to influencers to remind them of their disclosure obligations. Generally the advertisers are the ones responsible for ensuring those they hire abide by the FTC's rules and include legally sufficient disclosures on any posts. However, the FTC's recent activities seem to indicate it may place more of the risk and responsibility for such disclosures on the influencers themselves. Moreover, after the Fyre Festival and the resulting consumer backlash on social media influencers, there seems to be a shift in the market as to the strategy used for influencer campaigns. More and more agencies and brands seem to be shifting their focus away from big name influencers who have millions of followers to those influencers with a decent number of followers but are truly fans of the brand and regularly post about the brand. The latter type of campaign seems to cater more to the authentic relationship brands wish to build with their consumers, especially if those consumers are millennials.